Rebel fighters are continuing to attack western Aleppo despite the Russian and Syrian military holding a unilateral ceasefire. ITV News Correspondent Dan Rivers is on the ground in the besieged city and said: "There was no pause in the fighting in Aleppo - in fact, if anything, it's intensified." He described the increased sound of gunfire as "a modern soundtrack to this ancient city - cranked up to a deafening level." The offer of a ceasefire was rejected by rebels who claimed to be preparing for a counter-offensive to break the blockade. Earlier in the day, Syrian state media claimed the army had opened exit corridors in two designated areas - in the Bustan al Qasr quarter and near the Castello road in northern Aleppo - to allow people to leave. 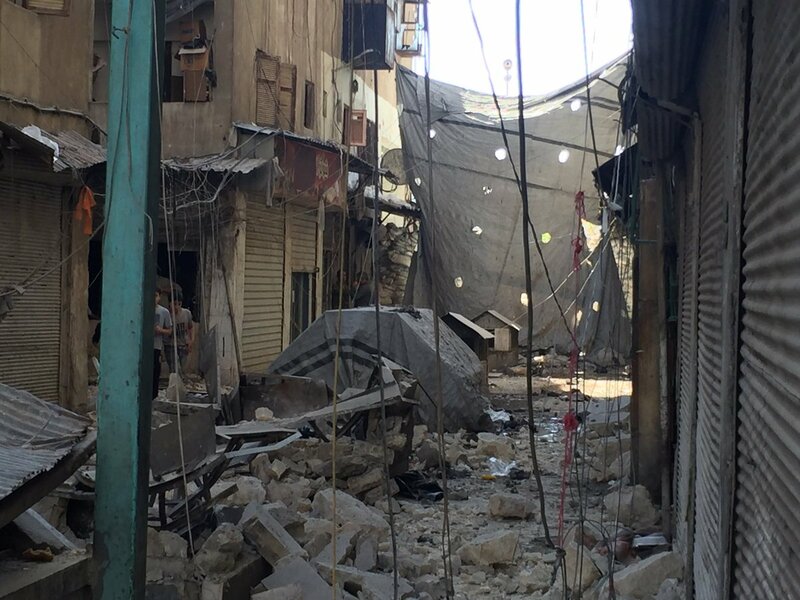 However ITV News saw Bustan al Qasr - an 'safe area' totally destroyed with rockets lying nearby. The Syrian regime laid on several buses, which were parked outside the municipal stadium in the Government-controlled area of al-Masharqa. Yet it became apparent "civilians on the other side [eastern Aleppo] were either unable or unwilling to cross the front line". Reporting from government-held western Aleppo, ITV News saw the moment rebel snipers sent soldiers and onlookers "scattering for their lives" as the sound of gunfire rung out all around. At one crossing point, they witnessed "civilians... fleeing rockets in terror", and just moments after leaving another area, a mortar exploded yards from where they had been standing. Later in the evening, Dan Rivers said: "The rebels seem to refuse to engage in this [ceasefire] process. "Today was a microcosm of the wider war - a complete lack of trust on both sides. Sources that we've spoken to in eastern Aleppo are telling us they just don't trust the Government's promises, the reassurances that all will be well if they got on those buses. "They say if they get on those buses they may never be seen again." Russia's defence ministry said President Vladimir Putin had ordered an extension of the initial 11-hour cessation of hostilities, which will now expire on Friday afternoon. However the extension is unlikely to stop the current attacks. Dan Rivers added: "I've never seen [as many] Russian troops on the front line like that. We've seen a convoy of Russian troops heading into Aleppo as we left the city this [Thursday] evening. "Russian ships and warplanes are heading to the Mediterranean to bolster the armaments that Russia have got in this fight. In short, Putin appears to be going all in on Syria."